I remember shopping with my parents for a new kettle in the 1970s, when I was about ten. In those days I was fascinated by new technology. I spotted a futuristic kettle appropriately called the Futura and thought that they should buy it. To me the the Russell Hobbs Futura was straight out of science fiction. My Dad thought that the solid sensible K2 was a better bet. The K2 was served us well and I never saw a Futura again until I started researching this piece. 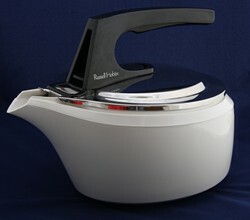 The Russell Hobbs Futura was the first plastic bodied kettle and the first kettle which could not be switched on without the elements being covered. It was the latest innovation from the Russell Hobbs company which started with the K1, the first kettle to switch itself off. Russell Hobbs claimed that one day all kettles would be like it. Russell Hobbs was too quick the market with a plastic kettle and the Futura was not a success for the company. In spite of making the first plastic kettle, Russell Hobbs later shunned them, claiming plastics tainted the water and continued to push the metal bodied K2. The gestation of the Russell Hobbs Futura goes back to 1969 when Roger Martin Snowball and Leonard Kenneth Morgan Masters filed two patents for a spout filling kettle. The first patent was for a water indication device and the second for easy replacement of the element by removing the lid. The drawings had some similarities to the eventual design for the Futura, but they were intended for a metal kettle and the overall design was much less flowing. The two inventors also made no mention of plastics. Russell Hobbs may have sold a kettle in the late 1960s called 'Futura' in stainless steel. I did uncover an entry for it in contemporary wholesale brochure (above right), however I have found no other evidence that it was sold to the public in this form. Several sources credit Julius Thalmann with the design for the Futura. It is likely that he reworked the original 1969 design for manufacture in plastic. Russell Hobbs registered a new design for a much smoother looking kettle very similar to final design for the Futura in 1971. In those drawings the kettle is organic in form and there is no provision for a power connection. Dr Michael Morecroft, TI Russell Hobbs' Engineering Director, claimed that the futuristic shape would not have been possible without using plastic for the body. Russell Hobbs launched the Futura 3510, the world's first plastic kettle, in 1972. It had a white handle and white body. The material was Noryl a heat resistant plastic developed by GEC in 1964. It was later used for the dashboard of the VW Golf Mk1. The Futura was, like the 1969 model, a spout filling kettle. You could not remove the lid and it had a level indicator so you knew how much water was in it. At launch the Futura sold for £9.65 [£90 in today's money] and received good reviews in the press. Sales of the original Futura were disappointing. People found the kettles discoloured quickly and heated water slowly. Spout filling kettles were unpopular because you could not tell if the kettle was clean and could you trust the level indicator? In 1978 Russell Hobbs updated the Futura with a new plastic, Kematal, which ICI developed in the 1960s. Martyn Rowlands (designer of the Trimphone) used this material for the world's first plastic taps in 1969. The new kettle was the Futura 3636. The Futura 3636 had a black Bakelite style handle which is the obvious distinguishing feature from the earlier model which had a white handle. The Futura was still expensive. It sold for an RRP of £27.95 in 1979 [£85 in today's money] and was more expensive than the reliable K2 and K2S. Unlike the jug kettles which blew away the traditional stainless steel kettles in the 1980s, the Futura offered few benefits over a metal kettle. You still needed to fill it with plenty of water, like an old fashioned kettle; it was slow to boil water and was unreliable and people still disliked spout filling kettles. Its only benefit was the futuristic design, which appealed to my ten year old self back in 1978. However, even that was out of date in the late 1970s. Most people wanted country cottage pine kitchens and traditional earthenware ceramics like Hornsea's Heirloom. This box for the Futura (pictured right) shows the gleaming white and chrome kettle, looking out of place next to a brown earthenware coffee set. 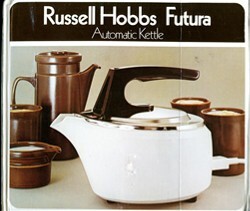 Russell Hobbs achieved a significant first with the Futura which contributed to the development of the jug kettles which followed it in the 1980s. However, the design failed to deliver any advantages over metal kettles and was a commercial failure. Today the Futura is being noticed by collectors. Very few come to the market, I would suggest you buy one now while they are relatively cheap. "Does anybody have any idea what one could sell for today.I have a used one,unboxed but fully working.It's in relatively good condition. I have just found a used Futura kettle in a flea market, in a reasonably good condition. The handle bears the mention "Nova", though, not Futura, but it is clearly a 3636. The vapostat, however, seems to switch off a few degrees too early, with water not quite warm enough to boil. Should "p patel" still have one or two of his switches, I'm clearly interested. Would you be so kind as to put us in touch ?